Houston Beyond Convention: The Photography of Ben DeSoto, 1980-present reflects on nearly four decades of work, past and present, produced by Houstonian Ben Tecumseh DeSoto, whose career spans genres of photography and a diversity of human experiences. After discovering his love for what he has called the "scientific magic" of the photographic process, DeSoto followed his passion for photography to a career chronicling his city. DeSoto has consistently challenged the viewer to see beyond static images of Houston, to look more deeply instead at the individual or community narrative behind the photograph. Presented thematically, the exhibit showcases DeSoto's documentation of Houston: portraits of local visual artists and musicians from fringe music and arts scenes, fine art photography, journalism, as well as his life's work, the Understanding Poverty Project. 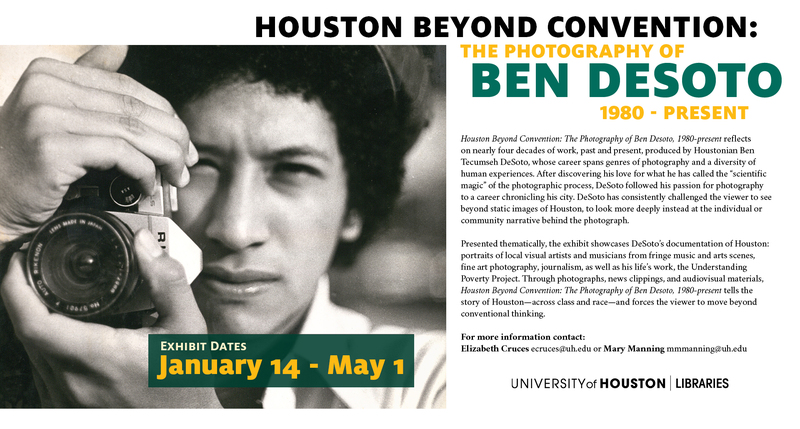 Through photographs, news clippings, and audiovisual materials, Houston Beyond Convention: The Photography of Ben DeSoto, 1980-present tells the story of Houston--across class and race--and forces the viewer to move beyond conventional thinking.